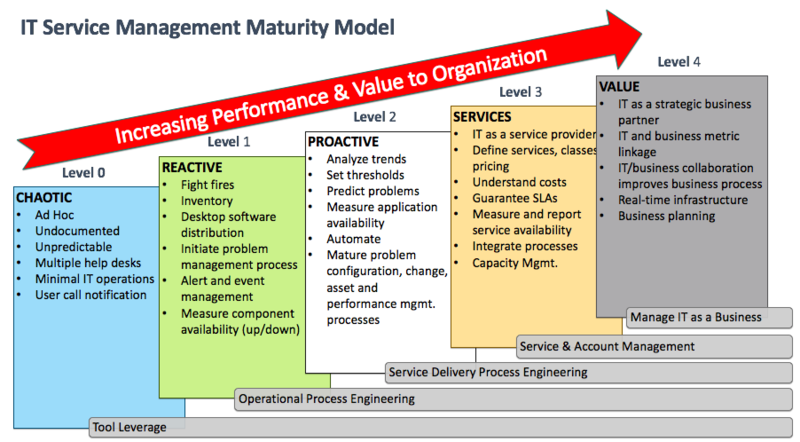 Almost 20 years ago Gartner, Inc. introduced the IT Service Management Maturity Model, in order to aid IT operations management in plotting a course to create value in IT Service Management. The model introduced five levels or positions, your IT Service Management might be at Chaotic, Reactive, Proactive, Service and Value. Ideally, you want to be in the final two levels to truly be optimizing your IT service management processes. Let’s discuss what each level means and how Opmantek’s solutions can assist you in improving your position. This is not where you want to be and most likely not where you are if you are reading this blog. Organizations in the Chaotic stage do things ad hoc and in an undocumented and unpredictable manner. They have multiple unconsolidated help desks, where users call to notify of issues and have minimal mature IT operations. These businesses are most likely part of the 21% of organizations who view IT as an expensive overhead, rather than the 45% of organizations who view IT as necessary. Businesses that are operating on the Reactive level have progressed from chaos, they now have basic backup and recovery (phew! ), they have basic inventory management and basic topology. There is basic events management and a system of trouble ticketing, but they are still just fighting fires when they occur. To progress from a Reactive position requires, at the minimum, performance management, change management, problem management, configuration management, automation, job scheduling and availability management. This is where Opmantek’s solutions can assist! The progression to have proactive IT Service Management is extremely simple, Opmantek’s core open-source software can handle this, there is no financial implications, just potential time to save. Open-AudIT – Open-AudIT is an open-source network discovery, inventory and audit program which can tell you exactly what is on your network, how it is configured and when it changes. You will need a program such as Open-AudIT in place to achieve the Reactive level with sophisticated inventory management. Open-AudIT can assist at the Proactive level for basic configuration and change management, with Open-AudIT Enterprise offering enhanced capabilities utilising baselines and Open-AudIT Professional and Enterprise offering network automation functionality. NMIS – NMIS is an open-source network management system, which monitors the status and performance of an organization’s IT environment, assists in identification and rectification of faults and provides valuable information for IT departments to plan infrastructure changes and investment. You will need a program such as NMIS in place to achieve the Reactive level and beyond. NMIS can initiate problem management and undertake alert and event management required at the Reactive level. NMIS can also assist with performance management, analyzing trends, thresholding and measuring application availability with automation capabilities. opEvents – opEvents enhances NMIS, reducing the business impact of network faults and failures using proactive event management to fast-track problem resolution, reduce outages, improve performance and decrease the cost of managing your IT environment. opEvents can assist you to achieve the Proactive level by automating the handling of events. opCharts – opCharts is a solution that brings to life NMIS data, that allows you to increase your network visibility, reduce organizational complexity and accelerate root cause discovery by visualizing all of the key information about their environment using dashboards, maps and charts. opCharts assists you to achieve the Proactive level through dashboarding and viewing multiple data sets showing trends, problems and availability with data from NMIS. opCharts also continues to be relevant in your progression to the Service and ultimately Value levels. opConfig – opConfig assists in disaster recovery, troubleshooting, compliance and change management allowing organizations to compare, track and manage change and compliance, with a full history of configuration information. opConfig can assist you to achieve the Proactive level by providing advanced automated change and compliance management, which then positions you to be able to move on up to the Service or Value stage of maturity. opFlow – opFlow is a solution designed to rapidly identify the root cause of poor network performance. opFlow can assist you to achieve a mature Proactive level in relation to your performance management processes. opTrend – opTrend is a solution providing cutting-edge analytics, identifying resources that are showing abnormal activity based on historical behavior and providing organizations with a true trend analysis of critical resources. opTrend can assist you to attain and progress from the Proactive stage by providing a more advanced level of trend analysis than NMIS. In a Proactive state, you are doing well as you have the solutions previously discussed in place and, like many others, you may be happy to just stay here and avoid reverting to a Reactive or Chaotic state. However, there is still room for improvement to further optimize your IT operations processes. You may be predicting problems, analyzing trends and automating tasks, but you could also be viewing IT as a service provider, having guaranteed Service Level Agreements (SLA) in place and measuring service availability. If you have reached the Service level, awesome work! You have almost completed your journey towards a complete optimization of your IT operations processes. At this stage, you understand the costs involved with IT operations, have SLAs in place and are managing service delivery with solutions such as NMIS and opCharts, that allow you to capture key information and then visualize it with dashboards. You are also undertaking capacity planning. All that is left to do now is to transition towards managing IT as a Business. opReports – opReports extends NMIS, by automating the creation and distribution of detailed operational and executive-level reports. opReports can assist you at the Service by reporting on service availability and capacity management data. It will also in your progression to the Value level with regards to business planning. To be operating at the highest level, the Value state, you have all the previous measures discussed in place to manage your IT operations. You are also now viewing IT as a strategic business partner, respecting the linkages between IT and business metrics, using management and business application data to improve the business process and inform planning, and experiencing enhanced cost recovery. Solutions such as Opmantek’s opCharts and opReports are allowing you to visualize and report on data you collect through your IT operations, and you are now using such software to inform improved business processes and planning. If you are in this stage of maturity of IT management processes you are likely experiencing a competitive advantage over your competition in your industry. In conclusion, to achieve optimization of your IT operations processes, it is essential to be operating at the Service or Value level of Gartner, Inc.’s IT Service Management Maturity Model with the help of solutions such as those provided by Opmantek. Progressing through the stages of the model will result in widespread improvements to your overall service management and provide many benefits to your organization. Gartner has reported that in the 1st year of implementing such framework, organizations experienced a 20% improvement to the initial incident response rate, decreased number of problems requiring multiple man-days, a 66% decrease in the number of major failures and a 20% decrease in human error in releases. After 3 years of implementing the framework, organizations experience a reduction in costs of 30%. Ultimately, Gartner, Inc.’s IT Service Management Maturity Model can help organizations manage risks, improve decision making, increase productivity and gain a competitive advantage from IT. If you need help progressing your level of maturity with respect to the framework, just reach out, a member of the Opmantek team would be happy to guide you through our solutions in a free product demo.